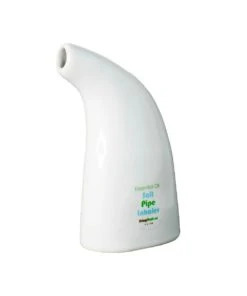 The salt inhaler, also known as a salt pipe has been featured on the Dr. Oz show and named one of Alternative Medicine’s 2010 Best New Products. It is so simple and easy to use: Inhale deeply through the mouth and exhale through the nose for 10 to 20 minutes, making it a goal to use the inhaler on at least every other breath. Alternatively, you can practice alternate nostril breathing, holding the inhaler to each nostril and inhaling deeply, while exhaling through the other nostril.